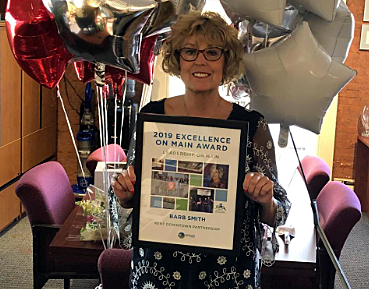 Barb Smith, the outgoing Executive Director of the Kent Downtown Partnership (KDP), was honored with the 2019 ‘Leadership on Main Award’ this week. Barb was hired as the Executive Director of the KDP in May of 2009, and will be celebrating a successful 10 years and a well-deserved retirement later this year. During Barb’s leadership, KDP has improved the appearance of downtown, created and honed its promotions, developed a solid fundraising strategy, and successfully recruited small businesses to the district. “A leader is someone who inspires others, who lifts others up and provides them with the direction, resources, and freedom to accomplish their goals and be part of the team. For these reasons, and many more, I am pleased to recognize Barb Smith with our 2019 Leadership on Main Award. “While none of this is insignificant, in my opinion, Barb’s greatest legacy in Kent is the team that she has developed, led, and inspired over the years. She has become a student of the Main Street Approach and worked to educate the KDP board and volunteers about its merits. While she is integrally involved in all of KDP’s committees, she has mastered the skill of leading volunteers by empowering them to be creative, productive, and focused on what inspires each of them to serve. “Barb has emphasized partnerships in everything she has done for KDP – the great relationships the program has with the city, downtown business and property owners, volunteers, and donors can all be credited to Barb’s relationship-oriented approach to community revitalization. On a personal note, everyone at I Love Kent has gotten to know and love Barb, and even though it’s been just a bit over a year since we met her, she feels like family to us!